One of the most anticipated additions to the Carmel Valley community is now officially open for business – Located on 23 acres with 96,000 sq. 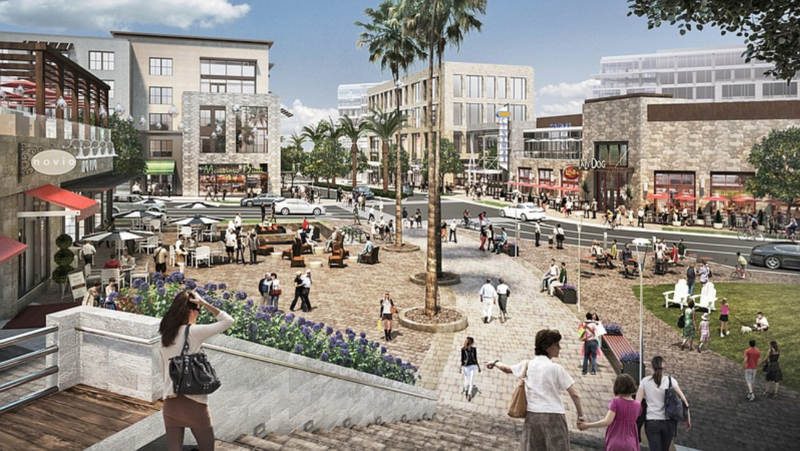 ft. of retail space, plus 608 luxury residential units and office development in the works, One Paseo is San Diego’s newest one of a kind: live, work & play setting. Developer – Kilroy Reality, set out to create environmentally conscious buildings and a way of life less centered around the car set in a “country meets coast” aesthetic. Everything you need for convenient day to day living within walking distance. Located just miles from the beautiful Del Mar coastline and minutes from I-5, One Paseo is an ideal location. For years, Carmel Valley has been a desirable community to live in, but has lacked a space to park and enjoy for hours. One Paseo offers something for everyone. Young families can stroll the expansive shopping grounds filled with unique courtyards while children can enjoy a new play structure called “The Log”, which is located in the Lumbaryard courtyard in the center of the property. For a more relaxing environment, you can head over to Koi Court where there is a beautiful koi pond and gathering space to take a rest from all of that shopping. Or gather and enjoy live music and movies on The Lawn. There is so much more that One Paseo has to offer, these are only a few. There is plenty of free parking to be had as well. So, if you are looking for a fresh and fun environment, get out and explore One Paseo – located at 12860 El Camino Real San Diego, CA. 92130. One Paseo | San Diego, CA | Project Film from Kilroy Realty on Vimeo.